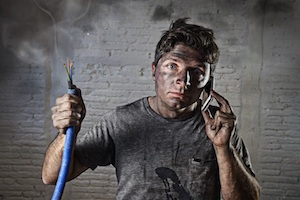 Should I Call for 24/7 Emergency Electrical Service Or Can I Quick Fix It Myself? Having access to a 24/7 emergency electrical service is a necessity, not a luxury. There’s no telling when something in your house’s electrical system might malfunction, and a quick response is crucial. At the same time, you might feel tempted to try your hand at fixing the problem yourself to save time and cut back on expenses. This is a big mistake, one that can jeopardize your safety while also costing you more money and time than you were hoping to save in the first place. Getting help from the professionals is by far the best way to handle electrical problems safely and effectively. Of all the reasons you shouldn’t try to perform electrical repairs yourself, the most important is the very real risk of hurting yourself. Electrical work can be dangerous, which is why experts go through so much training to do their job. Remember that every electrical system packs a huge punch of power, and a shock could be enough to injure or kill. Even if you think you’re knowledgeable enough to do the job yourself, there is always a chance of running into complications that only a professional can handle. Calling for 24/7 emergency electrical service is the right choice — your safety is too important to gamble with for the sake of saving money. If you’ve fallen victim to a serious electrical issue, trying to get the problem resolved quickly can backfire if it ends up being more serious than you suspected. A minor repair that seems to help the problem at first could be covering up a more critical issue, which could become a costly problem later on. A professional electrician will be thorough enough to find the root of your problem, and their experience will help them spot warning signs you might overlook. Remember: more important than fixing a problem fast is fixing it so the problem doesn’t come back. The possibility of saving money will always be one of the driving forces behind trying to fix things yourself. While this principle might work in some areas, electrical repairs belong in the realm of experts! If you attempt to fix your electrical problem on your own, you could end up making a mistake that only worsens the issue. Something as simple as a misplaced wire or an improperly installed component can cause serious damage to your system, as well as the very real risk of starting a fire. If this happens, the repair costs you’d be looking at will end up being much higher than the charges for emergency electrical service. By doing it yourself to save money, you could end up spending much more on top of suffering damage to your property. If you’re in need of a reliable 24/7 emergency electrical service, give Bryan Electric a call at (770) 680-2144 today! Don’t risk fixing it yourself — our professionals will get your problem taken care of quickly and efficiently; so, you can get back to focusing on what’s important to you.